There reportedly are some ruffled feathers over a bill in California – which was just passed on Wednesday — that will allow the owners of Southern California’s Hollywood Park Casino to continue offering card play, after shutting down its racetrack, despite its stake in a Las Vegas brick-and-mortar casino business. The law on the book prohibits entities with Las Vegas casino interests from operating card rooms in California. However, thanks to a legislative action, there will be an exemption. The bill would prohibit, during that 3-year divestment period, any funds used in connection with the capital improvement of the gambling enterprise or gambling establishment from being provided from the gaming revenues of either the business or organization engaged in prohibited forms of gaming. The bill would also provide that if, at the end of the 3-year divestment period, a person has not divested his or her interest in either the gambling enterprise or gambling establishment or the business or organization that is engaged in the form of prohibited gaming, the exemption would not apply to that person and that person shall be deemed to be unsuitable to hold a state gambling license to own a gambling establishment if the person, or any partner, officer, director, or shareholder of the person, has any financial interest in any business or organization that is engaged in any form of prohibited gaming, whether within or without this state, as specified. The bill was SB 472. Supporters of the plan argued it was necessary to preserve jobs and keep up the economic activity in the area. No one wants the facility to close. 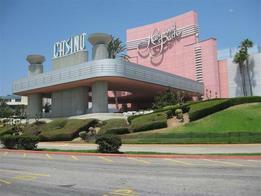 Opponents, which were other card rooms in the state, argued that it gives Hollywood Park an unfair advantage. The public pension fund enterprise Stockbridge Capital Group LLC owns Hollywood Park and also has a cut of the Sahara in Sin City, though the latter property is currently closed and undergoing renovations. That casino is located on the north end of the Strip. For more news from California, check out its state page.